Ubisoft wants to make more digital-only "mini triple A" titles. 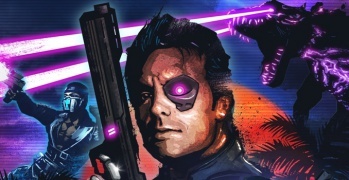 Far Cry 3: Blood Dragon was a hilariously 80s digital-only "expansion pack" to Far Cry 3 that used the base game's assets to make an entirely new adventure. We at The Escapist couldn't get enough of Blood Dragon and it looks like a lot of other people couldn't too, as Ubisoft CEO Yves Guillemot has announced it has sold over a million copies since its launch back in April. Guillemot says to expect more "mini triple A" titles like Blood Dragon and Call of Juarez: Gunslingers in the future. He explains that the prevalence of digital downloads means it is easier for devs to sell games that may be smaller in size but bigger in innovation. "You will see more and more of those [titles like Blood Dragon] in the future." He also hinted at a possible retail release for Blood Dragon, which may bring even more sales to the game. Not bad for a game that people were sure was an April Fool's joke when it was announced. In the full interview, Guillemot talks about current and future Ubisoft titles, as well as the company's own UBR Engine that powers games like Rayman Legends. Guillemot is very interested in licencing out its engine for other developers to use, but is first making sure the company can take care of maintenance and documentation. He also confirmed that a "free-to-play" version of Ubisoft's upcoming MMO-style shooter The Division is completely "off the table."